I’d want a supernatural body that is unfazed by gravity or raindrops. I’d want to spend my days zipping around lake skies at a breakneck pace, dancing out of shear joy. A smile would perpetually be renewed on my face. My dazzling, neon, green eyes would remain wide with wonder throughout my entire life. I’d search forever, looking for others to join me in a sky dance. I’d especially want to find someone trustworthy enough to ride with me on a tandem adventure. My friends would buzz beside me and with my family behind me we’d journey peacefully all together in a harmonic chaos. And even though my life would be short, I’d appreciate every minute. I’d take time to slow, to perch on a branch and gaze. Until one day my mortality would be revealed. My scaly wings would tear, preventing me from taking the air, but still I’d fight to get up and find my family again. And if there came a time when I knew the fight was done, I’d close my eyes in bliss and remember a life well lived. The answer is clear. 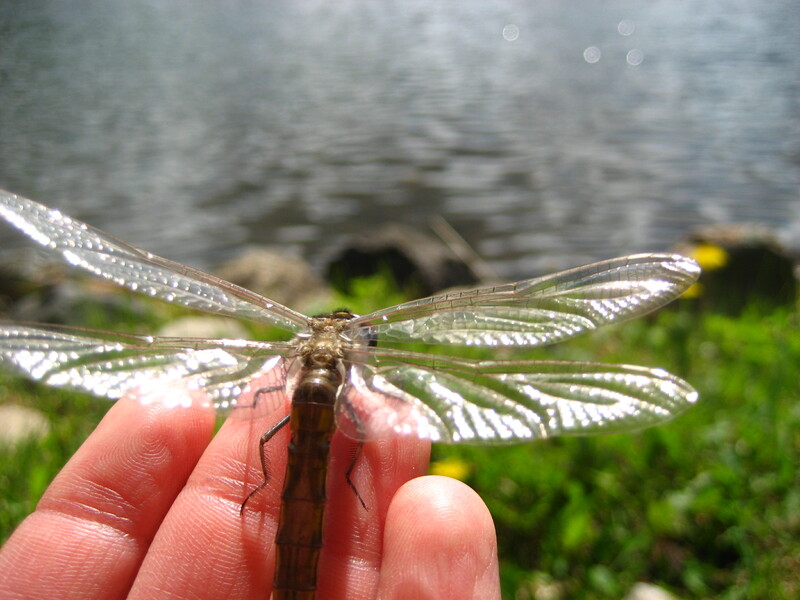 If I could be any insect, I’d be a Round Lake dragonfly.